A summer-long preview of SUNY Oswego's two-year, college-wide Grand Challenges Project: Fresh Water for All will unfold in a multidimensional exhibition and speaker series opening in June at Oswego State Downtown, titled "We Are Lake Ontario." At a free public reception from 5:30 to 7:30 p.m. Friday, June 15, at the downtown branch of Tyler Art Gallery, students will employ their original art, poetry and music to highlight the shared responsibility for keeping Lake Ontario clean. The exhibition will run June 13 through Aug. 20. "All of our students investigated some aspect of our cherished resource and our responsibility as stewards of Lake Ontario," said SUNY Oswego art faculty member Amy E. Bartell, coordinator of community arts programming. Preparing for the exhibition engaged 20 students in Bartell's recent digital illustration classes, 17 poetry students of Laura Donnelly in English and creative writing, and senior music and English major John Horne, who composed a piece for the occasion under the mentorship of Paul Leary. Artists with works in the show include Zachery Anarella, Fergelyn Baliclic, Olivia Cosgrove, Erin DiBenedetto, Jean Dicarri, PJ Gebhardt, Nick Greco, Robert Hohman, Zac Holt, Jessica Kummrow, Ceseley Mulligan, Emily Nestor, Keri Nguyen, Tyler Rhinehardt, Joel Schlauer, Alyssa Schock, Aaron Scott, Rebecca Smith, Allie Stango and Kiera Thompson. Donnelly's poetry students published their poems as a chapbook. They included Cody Bateson, Tian Burte, Ashley Cavallo, Jailene Colon, Brian Davis-Reardon, Taylor Earle, Jack Goodfellow, Keturah Hancock, Randy Lau, David Manke, Carrie McIntosh, Morgan O'Grady, Rebecca Ortlieb, Joseph Sigurdson, Imani Simpson, Kirsten Staller and Liberty Yalch. Bartell called Lake Ontario "a unique, miraculous and sometimes challenging gift" for those living on its shores or using it in any way. "We do have responsibility to own that place and maintain it in some way," she said. The exhibition and a brown-bag speakers series will aim to engage community organizers and stakeholders. Featured speakers -- all three appearing at noon at Oswego State Downtown -- are Leigh Allison Wilson, an English and creative writing professor who is coordinating the Grand Challenges Project, on June 21; Susan Gateley, a sailor and scholar who writes frequently about Lake Ontario, on July 12; and Bartell on July 19. Art, poetry and music often speak to universal experiences, such as beauty, loss and joy, Bartell said. Lake Ontario inspires all of those feelings and more -- feelings that "We Are Lake Ontario" wants to harness in the service of making positive change. "Students respond to the opportunity to be part of something real, the opportunity to make some change for good," she said. Oswego State Downtown, on the corner of West First and Bridge streets in Oswego, is open noon to 5 p.m. Wednesdays, 10 a.m. to 5 p.m. Thursdays and Fridays, and 11 a.m. to 5 p.m. Saturdays. The college's first two-year Grand Challenges Project will explore, in classrooms and events across all disciplines, the impact that Fresh Water for All would have across every aspect of the global community. College President Deborah F. Stanley, in announcing the Grand Challenge, described the project this way: "Grounded in shared goals, integrative skills and technologies, and an interdisciplinary approach to problem solving, the Grand Challenges Project reinforces the fact that today's solutions need to include many stakeholders across a spectrum of scholarship, creative activity and opinion." For more information, visit oswego.edu/grand-challenges. 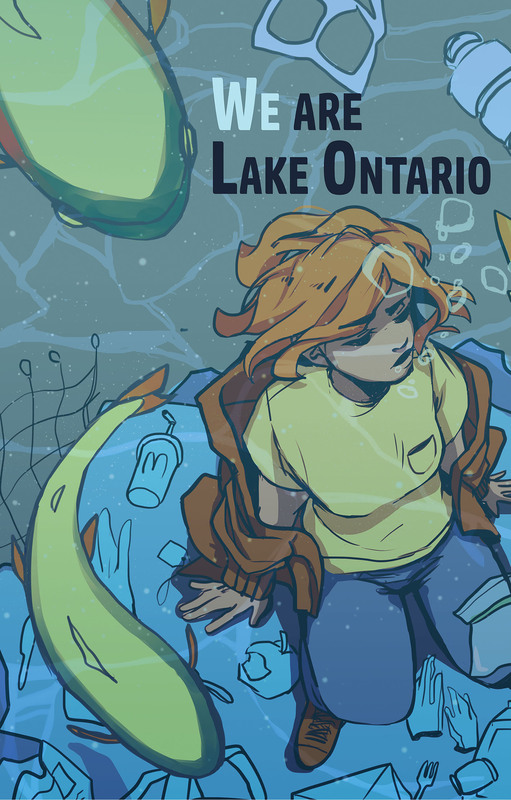 Shared responsibility -- SUNY Oswego senior graphic design major Fergelyn Baliclic's digital illustration joins those of 19 of her classmates in an exhibition titled "We Are Lake Ontario" running June 13 to Aug. 20 at Oswego State Downtown. Student poets and a musician also will offer their original contributions, all designed to inspire visitors to take seriously the shared responsibility for the neighboring Great Lake.